M T D D e c e m b e r 2 0 1 8 4 E d i t o r i a l D espite his business success, Mike Caroglanian has his concerns. 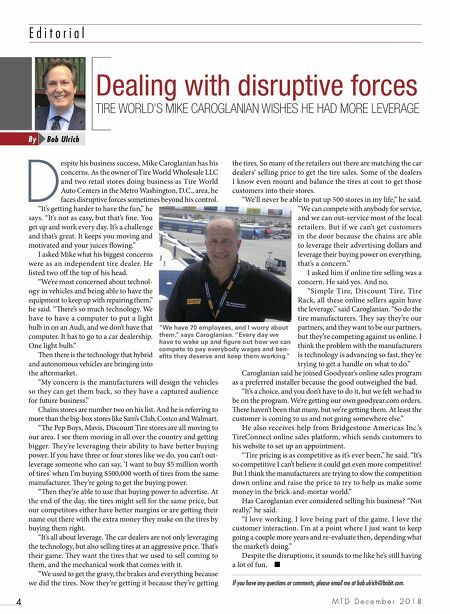 As the owner of Tire World Wholesale LLC and two retail stores doing business as Tire World Auto Centers in the Metro Washington, D.C., area, he faces disruptive forces sometimes beyond his control. "It's getting harder to have the fun," he says. "It's not as easy, but that's fine. You get up and work every day. It's a challenge and that's great. It keeps you moving and motivated and your juices flowing." I asked Mike what his biggest concerns were as an independent tire dealer. He listed two off the top of his head. "We're most concerned about technol- ogy in vehicles and being able to have the equipment to keep up with repairing them," he said. "ere's so much technology. We have to have a computer to put a light bulb in on an Audi, and we don't have that computer. It has to go to a car dealership. One light bulb." en there is the technology that hybrid and autonomous vehicles are bringing into the aermarket. "My concern is the manufacturers will design the vehicles so they can get them back, so they have a captured audience for future business." Chains stores are number two on his list. And he is referring to more than the big-box stores like Sam's Club, Costco and Walmart. "e Pep Boys, Mavis, Discount Tire stores are all moving to our area. I see them moving in all over the country and getting bigger. ey're leveraging their ability to have better buying power. If you have three or four stores like we do, you can't out- leverage someone who can say, 'I want to buy $5 million worth of tires' when I'm buying $500,000 worth of tires from the same manufacturer. ey're going to get the buying power. "en they're able to use that buying power to advertise. At the end of the day, the tires might sell for the same price, but our competitors either have better margins or are getting their name out there with the extra money they make on the tires by buying them right. "It's all about leverage. e car dealers are not only leveraging the technology, but also selling tires at an aggressive price. at's their game. ey want the tires that we used to sell coming to them, and the mechanical work that comes with it. "We used to get the gravy, the brakes and everything because we did the tires. Now they're getting it because they're getting the tires. So many of the retailers out there are matching the car dealers' selling price to get the tire sales. Some of the dealers I know even mount and balance the tires at cost to get those customers into their stores. "We'll never be able to put up 500 stores in my life," he said. "We can compete with anybody for service, and we can out-service most of the local retailers. But if we can't get customers in the door because the chains are able to leverage their advertising dollars and leverage their buying power on everything, that's a concern." I asked him if online tire selling was a concern. He said yes. And no. "Simple Tire, Discount Tire, Tire Rack, all these online sellers again have the leverage," said Caroglanian. 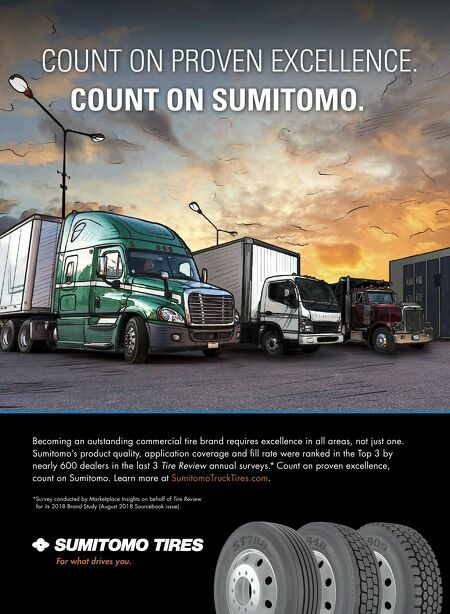 "So do the tire manufacturers. ey say they're our partners, and they want to be our partners, but they're competing against us online. I think the problem with the manufacturers is technology is advancing so fast, they're trying to get a handle on what to do." Caroglanian said he joined Goodyear's online sales program as a preferred installer because the good outweighed the bad. "It's a choice, and you don't have to do it, but we felt we had to be on the program. We're getting our own goodyear.com orders. ere haven't been that many, but we're getting them. At least the customer is coming to us and not going somewhere else." He also receives help from Bridgestone Americas Inc.'s TireConnect online sales platform, which sends customers to his website to set up an appointment. "Tire pricing is as competitive as it's ever been," he said. "It's so competitive I can't believe it could get even more competitive! But I think the manufacturers are trying to slow the competition down online and raise the price to try to help us make some money in the brick-and-mortar world." Has Caroglanian ever considered selling his business? "Not really," he said. "I love working. I love being part of the game. I love the customer interaction. I'm at a point where I just want to keep going a couple more years and re-evaluate then, depending what the market's doing." Despite the disruptions, it sounds to me like he's still having a lot of fun. ■ If you have any questions or comments, please email me at bob.ulrich@bobit.com. Dealing with disruptive forces TIRE WORLD'S MIKE CAROGLANIAN WISHES HE HAD MORE LEVERAGE Bob Ulrich By "We have 70 employees, and I worry about them," says Caroglanian. "Every day we have to wake up and figure out how we can compete to pay everybody wages and ben- efits they deserve and keep them working."